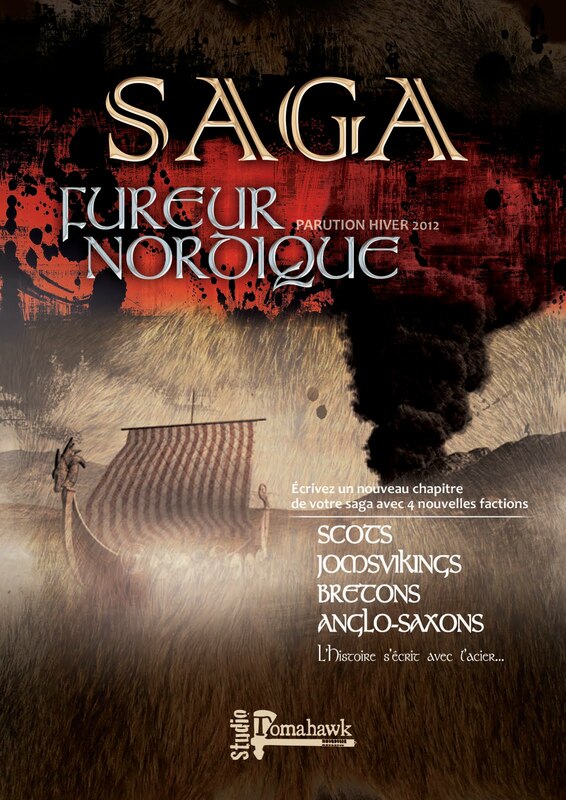 English text below Cette semaine, pour bien débuter cette année 2012, nous commençons une série d'avant-premières hebdomadaires qui lèveront progressivement le voile sur le premier supplément de Saga, Fureur Nordique. En guise de préambule, nous allons vous parler de deux nouvelles Épées à Louer, qui seront disponibles dans les jours à venir, annonciateurs et hérauts du supplément à venir. Ces nouvelles unités seront disponibles en blisters, avec une carte détaillant leurs caractéristiques incluses avec les figurines. Et qui de mieux pour parler de ces nouveautés que les joueurs ayant participé aux tests du jeu ? Donc nous avons décidé de laisser la parole à ceux qui sur ces derniers 6 mois, ont intensivement participé au développement de ces nouvelles factions et unités. Pour commencer, le Champion de Saga, Mike Hobbs. 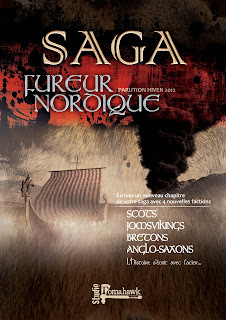 Mike, à toi la parole... "
Cette unité inclut Egil et 3 ou 7 Hirdmen Viking (du nombre de Hirdmen dépend le coût de l'unité) et ces bougres combattront comme une seule unité, qui pourra être recruté par tous à part les Vikings. Below you will find the first installment of a weekly mini serie of articles that will preview some of the stuff that Northern Fury, the first Saga supplement, will introduce. With the new factions only a few weeks away from release we thought it would good to ask some of our loyal playtesters to give an overview of what to expect and over the next few weeks these will be published on the Studio Tomahawk site. However along with the Northern Fury faction pack Studio Tomahawk and Gripping Beast will also be releasing rules for 2 new Swords for hire units, so we thought we’d start there. The first sneak peek is left to no one else that the Saga Herald, Mike Hobbs. 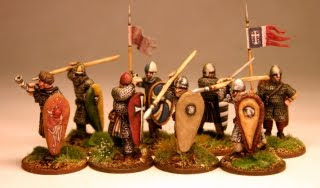 Flanders has always been an important area in Europe and stood on the crossroads between incursions from the Vikings to the North and the Normans to the South, during the Dark Ages it was famed for its spearmen and it is a unit of heavy warriors that the Swords for Hire card represent. For 1pt you get a unit of 8 warriors with armour equal to any Hearthguard unit but due to this armour they move slower than other units. They also have a few other tweaks that make them standout from standard units and make them an interesting choice in any warband. Defensively they are very strong and will help any faction weak on defensive abilities or in any scenario where you are forced to defend. Egil Skalagrimsson was a well known Icelandic adventurer from the 10th Century, due to his bad temper he was banished and so headed to England to make his fortune. 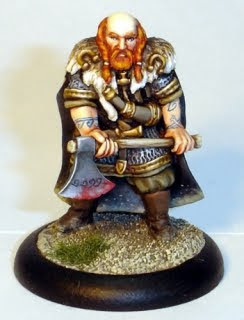 The Swords for Hire unit includes Egil plus a choice of 3 or 7 Viking Hirdsmen (depending on how much you want to spend on the unit) and this unit has to fight as a single unit, it is available to any non Viking warband. What makes this unit standout is the fact it uses the Viking battleboard and generates its own Saga dice, add to this the fact that Egil is almost as powerful as a standard warlord. As you can see Egil is a fairly heavy hitter in the Swords for Hire group. Tactically Egil takes a bit of getting used to as a player will have to use 2 battleboards during the game, but this is offset by having a character almost as powerful as a warlord on the table. This can also cause headaches for your opponent and may upset their plans for victory. As Egil can cost up to 3pts it’s a large investment in a standard game, however for sheer fun it’s often well worth it.